Gold-plated hi-fi, Sir? No problem | What Hi-Fi? 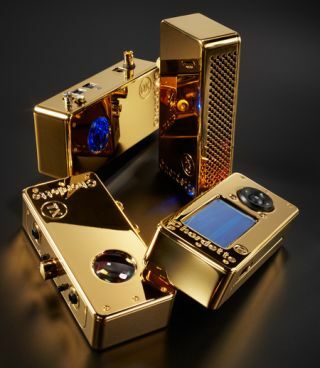 For the ultimate in bling, how about wrapping your beloved electronics in gold plate? Chord Electronics will duly oblige, offering its new Chordette MX Series in a choice of extreme high-quality finishes, including highly polished gold plate or a fine-beaded aluminium finish (silver). You can also have black. The four-strong MX-Series features a new ‘squared-off’ design to the casework, and a new Chordette logo. The full range comprises: the IX streamer; the SX amplifier; the QX 192kHz DSD DAC; and the TX headphone amp. Each unit costs £990 in plain old black, but you’ll pay £2490 for the gold finish. The products can be used on their own, or integrated as a full system using Chord's recently launched Coupé Carry rack system. Under the lid, the SX is a Class AB, vertical MOSFET amp which can be used in stereo or mono mode (when bridged). Based on the Chordette Scamp amp, with additional RCA inputs in place of the 48kHz USB input, it will allow other MX units to play directly into the apt-X Bluetooth, 35W-per-channel amp. The QX DAC (digital-to-analogue converter) is based on Chord's Award-winning QuteHD and can play DSD (Direct Stream Digital) and 192kHz files over USB. The field programmable gate array (FPGA) device can also accept the digital BNC input from the IX. As for the IX itself, which is based on the Index network music player, the streamer and internet radio device can access music stored on a networked computer, NAS (network attached storage device) or USB stick, with control via a smartphone or tablet. And finally, the TX headphone amp has both balanced and RCA inputs, and a USB input for music replay from computers through the unit's high-quality DAC. There are dual headphone sockets, so two people can listen simultaneously.